Huh? What, besides Christmas, is there to get excited about during a Bellingham winter? It’s going to be drab, cold and wet. Ah yes, but as the clouds roll in and the sun disappears for a few months, thoughts turn to the blue skies, warm temperatures and immaculately-conditioned golf courses of Palm Springs. Can’t wait! In Bellingham we see plenty of water during fall and winter - 24.7 inches of it drop from the sky between October and March (according to the Federal Research Division of the Library of Congress). But those fortunate enough to find themselves at the La Quinta Resort and Club in California’s Coachella Valley will probably see an awful lot more. There are 41, yes 41, swimming pools and 53, yes 53, hot spas at La Quinta, one of only two resorts in the country for which a city has been named (first person to tell me the other wins a sleeve of TaylorMade TP Black golf balls - use the Contact Form here). And if that isn’t enough water, the resort’s Pete Dye-designed Dunes Course, which opened in 1985, has eight major water hazards - not feeble, threadlike creeks the marketing department might use to brag about the number of holes at which water comes into play, but the type of water hazard you could go boating on. The world-famous La Quinta Resort & Club, now owned by the Waldorf Astoria Collection, opened the day after Christmas in 1926. Spread out over 45 acres, it was developed by local businessman Walter Morgan who purchased 1,400 acres from the Cahuilla Indian tribe and commissioned Pasadena-based architect Gordon Kaufman to build him a hacienda-style hotel. 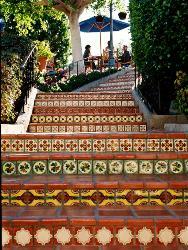 Kaufman built an adobe structure using 100,000 bricks, 60,000 roof tiles and 5,000 floor tiles. Construction cost $150,000. Following several expansions - carefully and skillfully orchestrated expansions - the resort now possesses 796 guest rooms and 23 tennis courts in addition to all those pools, but maintains much of the original character. With countless beds of colorful flowers; orange, lemon, tangerine, tangelo and grapefruit trees; cypress trees; cacti; numerous waterfalls; and quaint courtyards framed by towering palms, La Quinta is a serene and peaceful place and, especially at this time of year, the sort of place you spend the night dreaming about, and perhaps much of the day too. The Dunes Course is a very rare animal - a Pete Dye layout that few outside of the Valley are familiar with and which gets overshadowed by its near neighbors, among them the Greg Norman Course and Jack Nicklaus Tournament Course at PGA West (a 2,200-acre golfing fantasyland also owned by The Waldorf Astoria Collection), and two other Dye creations - the TPC Stadium Course at PGA West and La Quinta’s Mountain Course. So anonymous is the Dunes, in fact, writer Chris Baldwin once described it as a ‘mob witness working in a Kansas grocery store’. And yet, were it located in a part of the country where golf courses didn’t collect in such huge numbers, it would surely be regarded in a wholly different light. But even here in the Coachella Valley, where roughly 130 courses compete for space with hundreds of luxury desert homes, thousands of hotels, an estimated 1,700 restaurants and the Santa Rosa Mountains (the mountains usually prevail), the Dunes’ star has risen recently thanks to a number of upgrades instigated by La Quinta and PGA West’s Director of Agronomy Dean Miller. “Over the last four years we have spent over $10 million in making capital improvements to the golf courses,” says Miller. “We have improved the bunkers, cart paths, the irrigation system and made several landscape renovations.” The layouts are also benefitting from some major on-going maintenance projects. “Deep-tine aerification of our greens and fairways, as well as soil-improvement strategies, are creating better turf conditions,” Miller adds. And the improvements to the irrigation system are not only helping to establish more uniform turf coverage but also allowing Miller to gain better control of how much water is actually used. Winter is, of course, the time to play golf in Palm Springs, La Quinta, Palm Desert or any of the other six cities that lie in the Coachella Valley which is bounded by the Little San Bernardino Mountains to the north and the Santa Rosa and San Jacinto Mountains to the south. Temperatures rarely rise above 80 degrees in December and January, but rarely dip below 70. And with an average of 348 days of sunshine a year and a little over three inches of precipitation, you’re more or less assured of not having to resort to the resort's rainy day activities. Another course that flies under the national radar but which Coachella regulars consider a must-play, and which you should definitely consider for your winter trip, is Escena, just a stone’s throw from the Palm Springs International Airport and designed by the Nicklaus Design Group in 2005. The course re-opened in November 2009 after two years spent sitting idle during the worst of real estate collapse and is now among the city’s busiest courses having been ranked #6 in the whole of California by Chris Dunham of PGATour.com - one place lower than Torrey Pines South but two higher than the Mountain Course at La Quinta. The General Manager is Todd Connelly who worked at Pumpkin Ridge in North Plains, OR., and Bear Creek in Woodinville, WA., before heading south. "It’s so nice to see many old friends from the Northwest come down," says Connelly who adds that as a PGA member he would be welcome at most other courses in the region but rarely plays away from his new home. "Because of my position, I’m able to play many of the courses in the area free of charge," he says. ‘But I rarely venture away from Escena. It really is a great course." The Escena Discount Card offered golfers up to 30% savings on green fees last year. Details for this winter’s card haven’t yet been finalized, but Escena regulars can expect some deep discounts once again. 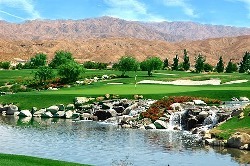 Two other perennial Valley favorites are the wonderful Legend Course at 36-hole Tahquitz Creek - a City of Palm Springs facility - and the fantastic Firecliff Course at the Palm Desert-owned Desert Willow which, if it weren’t for Torrey Pines in San Diego and Harding Park in San Francisco, might just be considered the top municipal in California. 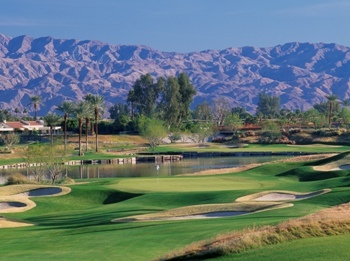 Designed by Michael Hurdzan and Dana Fry with an assist from Champions Tour player John Cook, Firecliff stretches to 7,056 yards, making it 143 yards longer than the Mountain View Course which might not receive such high technical marks as its closest neighbor but whose approval ratings among visitors compare just as favorably. Together, Firecliff and Mountain View record roughly 83,000 rounds a year, a total that places them among the region’s most popular double-acts. The Legend at Tahquitz Creek was designed in 1957 by Billy Bell, and renovated at the turn of the century by the Palmer Design Company which added 40 bunkers. At 6,815 yards from the back tees, the Legend is 110 yards longer than the equally popular Resort Course designed by Ted Robinson and opened in 1995. It’s sweet a deal that makes Palm Springs even more alluring, if that’s possible. When to go: Winter. You don't want to miss any glorious fall days in Bellingham, Palm Springs courses tend to overseed in Septemeber/October, summer's way too hot in the Coachella Valley for most human beings, and temperatures in March and April can get up into the 90s. That pretty much leaves December, January and February when it's 30 degrees and raining/snowing here, but 75-85 degrees and sunny down there. Green Fees: Range from about $75 at the city-owned courses to $179 for the Stadium Course at PGA West. Watch each course's web sites (below) for specials. Getting There: Fly direct to Palm Springs International Airport from Bellingham with Allegiant. Services begin September 25th. There will be four flights a week through October and November, two in the first two weeks of December, five for the last two weeks. Three or four flights a week will be available over January and February. The last direct flight will be on Monday March 7th. Fares start at $89.99 one-way. Getting Around: Rental cars are available at Palm Springs International Airport. La Quinta is half an hour away, PGA West just a few minutes further on. Desert Willow is 20 minutes away in Palm Desert. The Classic Club is about a 15-minute drive east while Tahquitz is just a couple of miles south of the runway. Escena is just a few minutes from the terminal buiding on the other side of the North Gene Autrey Trail. For the Non-Golfer: Hummer off-roading in the desert and mountains, the Palm Springs Aerial Tramway, hiking in the desert canyons, Palm Springs Celebrity Tours, tennis in Ruth Hardy Park, a visit to the Coachella Valley Preserve, Palm Springs Oasis Water Park.